Bidh ceol s orain gu leor ri chluinntinn an Grinneabhat am Braghdhair oidhche Haoine. Tha Rodaidh Beag a Plasterfield air CD ur de d'orain 's puirt a' mhelodian a toirt cruinn. Thigeamh a Ghrinnebhat Dihaoine. Cumadh sibh nar cuimhne gum bi Ceilidh Na Gaidhlig ann s Na Gearranann an ath mhios. Tha na clasaichean Gaidhlig a cumail a dol taing do Bhord na Gaidhlig agus Sgioba na Gaidhlig. Air feasgar Dihaoine bidh sinne a coinneachadh aig Taigh a' Chusbainn ann an Steornabhagh. Tha duil gum bi buidheann comhraidh a tighinn cruinn ann an uine gun a bhith fada,Agus bidh beagan mu dheidhinn cruinneachadh de sheanchasan a tighinn thugaimh a dh'aithghearr. Chaidh Laraich a chur air chois airson cruinneachadh seanchasan mu cuid de na ainmean aite ann an sgire Bun a Loch. Bidh cuid den fhiosrachadh ri fhaicinn Dihaoine 28mh agus Disathuirne 29mh anns an Ionad Coimhearsnachd ann an Liurbost..
Bha cleachdadh aig buill de choimh thional gi na 1950an a bhith a seinn nan sailm anns na h-eathraichean nuair a bhiodh iad a tilleadh as an eaglais. Am bailtean air criochan Loch Eireasoirt, na Loch chluinneadh na guthan air tir. Bidh grunn luchd ealain, luchd seinn nan sailm agus seoldairean a tighinn cruinn eadar 13mh agus an 28mh latha den mhios seo. Cur fios gu Deirdre Ni Mhathuna d.ni.mhathuna@outlook.com neo Magaidh maggiesmith@hebrides.net airson tuilleadh fiosrachadh mun na tachartasan. 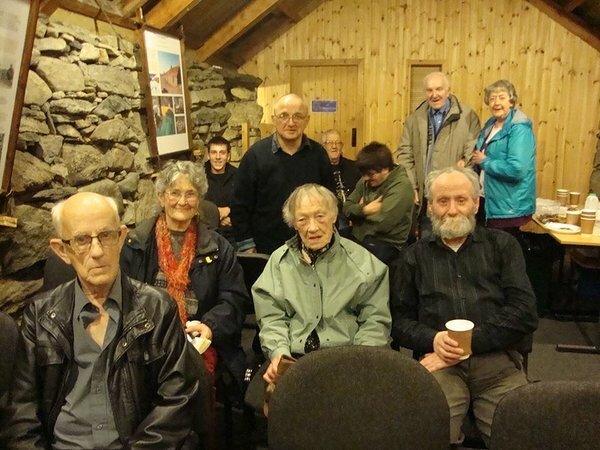 Aig Cèilidh na Gàidhlig anns a’Hut air a’ Bhac, bha deilbh cluich ùra, Còisir Sgìre a’ Bhac, àmhrain agus ceòl às an dualchas. Tha Cèilidh na Gàidhlig ag amas a bhith ann an sgìrean eadar-dhealaichte gach mìos le seinneadairean às gach àite.’S ann an Grinneabhat am Bràdhghair a bhios an ath cruinneachadh air Dihaoine 29mh Ghiblein. Thathas a targaideachd air luchd amhairc dràma na Gàidhlig a leudachadh, toirt cothrom ga luchd ionnsachaidh na Gàidhlig a bhith a’ cluinntin an cànan mar a tha e am beul nan daoine agus a’ neartachadh a’ chànan le muinntir an àite seo fhein a tighinn cruinn. Tha am buidheann Cabraich a chur air adhart na tachartasan, a luib buidhnean iomairt ann an sgìrean fa leth, a tha a strì airson a’ Ghaidhlig a neartachadh nan coimhearsnachd fhèin. An Sgìre a’ Bhac bha Raonaid Cheannadach Iomairt Loch a Tuath CNAG, a sàs a cur air dòigh na h-oidhche. Tha Cabraich a faighinn taic bho Bòrd na Gàidhlig, Creative Scotland agus CNES. A’gabhail pàrt sa chùirm bha Còisir Sgìre a Bhac, Cèitidh Greumach Am Bac, Còmhlann Òigridh a’ Mhelòdian Am Bac, sgoilearan Sgoil MhicNeacail agus an dealbh cluich Fèineag, Alasdair Mac’Ille Fhinnein Siabost agus Magaidh Nic a Ghobhainn na Lochan agus an dealbh cluich An Turas, Màighread Stiùbhart Am Bac, Donnchadh Shirkie An Taobh Siar, Sam MacAoidh An Taobh Siar, Anna Nic ‘Ille Fhinnein Siàbost, Nìall MacRisnidh Càrlabhagh, Dòmhnall Saunders, An Taobh Siar, Ruaraidh Dòmhnallach, Steòrnabhagh, Mairi Nic Ille Fhinnein Am Bac agus Fear an Taighe Coinneach Mòr MacIomhair. The event has several targets: to strengthen the use of Gaelic in the communities, to bring drama to a new audience and to enable Gaelic learners to be immersed in the language and island culture for an evening. Bidh farpais bardachd Slam ann an Steornabhagh air an 16mh den Fhaoileach 2016. A bheil tri piossan bardachd agaibh deiseil? Domhnall Macleoid talantach an thuirt thu? Bidh a'chiad Oidhche na Gaidhlig ann an Taigh Dhonchaidh air Diardaoin an 16mh den ath mhios (A Ghiblein), Bidh cearcall comhraidh ann aig 6.30f cearcall seinn an deidh sin aig 7.30 agus ceilidh le dealbh cluich, sgeulachdan agus orain an deidh sin.Thug Bòrd na Gàidhlig agus Comhairle nan Eilean Siar taic airson Oidhche na Gaidhlig a chur air adhart. Gealladh a Bhàird Peigi Oighrig Nic A Ghobhainn ag innse mar a fhuair i git a' bhardachd bho brathar a seanair air leabaidh a bhais. Feis nan daoine a tha air an dreuchd a ligeil dhiubh agus a tha a lorg cur seachadh ur. Bidh sniomh is bardachd is fiolmaichean aig Talla Bhreascleit feasgar DiCiadain an 30mh den mhios seo. Prothaid an duine uasal dhith, toirt buille bais gach uair. S na fleuran caomh air druim a' fhraoich a cromadh sios an ceann. Tha sònaSonas taingeil airson taic bho Alba Cruthachail, Bhòrd na Gàidhlig, An Lòchran agus Glaschu Beò. Cuin' a bha thu ann a Yarmouth?